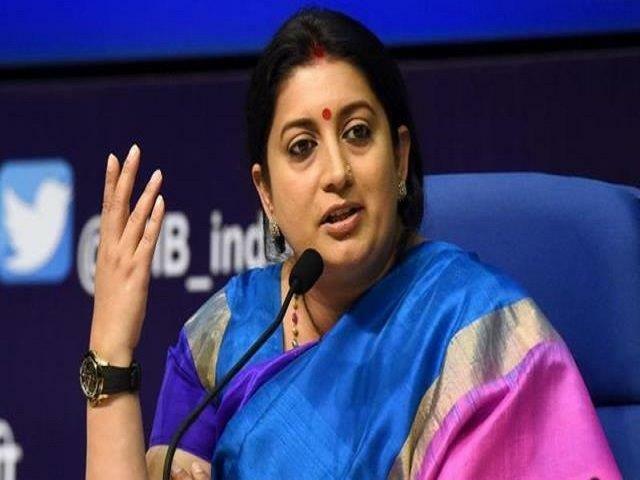 Haryana: The Central government would assist Haryana in developing silk weaving units in Panipat, Ambala, Sirsa and Panchkula, Union Textile Minister Smriti Zubin Irani said. She, along with Chief Minister Manohar Lal Khattar, laid the foundation stone of the National Institute of Fashion Technology (NIFT) Centre here. Irani said that both Central and state governments would make novel efforts in these four districts in the next one year. Describing textile as the second largest employer after agriculture, she said that since the Haryana government had received investment proposals worth Rs 7 lakh crore from prospective investors, the Central government would lend all support for execution of the agreements Haryana had entered into for development of textile industries. She congratulated the Chief Minister for fast-tracking execution of the NIFT project announced way back in 2011. It clearly indicates that the previous government only fooled the people with false announcements on projects without any intention of implementing them, she said. On the contrary, the present BJP government at the Centre and in the state, are implementing all the announcements made in the interest of the people, she said. Taking a dig at the previous government, she recalled how during a discussion at the national level about Haryana during the 2014 Lok Sabha elections, the name of a “Damaad Ji” (referring to Sonia Gandhi’s son-in-law Robert Varda) cropped up in the context of corruption issues. Slamming the door shut on graft, Haryana has done a great job by securing rank among top five states in terms of ease of doing business, she said. She lauded the efforts made by the Chief Minister in bringing about transparency in the functioning of the government which was earlier shrouded in corruption. The NIFT Centre would be completed in two years and the students enrolled would get guidance from international experts as the Centre has agreement with 32 global institutes, she added. Speaking on the occasion, the Chief Minister said that though land had been allotted, the project did not take off due to disputes between leaders of the previous government. Now, we have decided to execute all pending works, he said. Apart from NIFT, work has also been started on four-laning of the National Highway-73 and the Kundli-Manesar-Palwal expressway, he said.